080628-N-0640K-031 PANAY ISLAND, Philippines (June 28, 2008) Members of the Armed Forces of the Phillipines (AFP) load an HH-60H Seahawk assigned to the "Black Knights" of Helicopter Anti-Submarine Squadron (HS) 4 with boxes of food at Iloilo Airport. The U.S. Navy and the AFP have been working side by side during disaster relief efforts in the wake of Typhoon Fengshen. At the request of the government of the Republic of the Philippines, the Nimitz-class aircraft carrier USS Ronald Reagan (CVN 76) is off the coast of Panay Island providing humanitarian assistance and disaster response. Ronald Reagan and other U.S. Navy ships are operating in the 7th Fleet area of responsibility to promote peace, cooperation and stability. U.S. Embassy Manila: Helicopters deliver aid to the victims of Typhoon Frank. The immediate disaster relief aid deliveries were made possible by the arrival of the USS Ronald Reagan carrier group which ran round-the-clock helicopter runs as part of the joint U.S.-RP humanitarian relief effort. Over 320 sorties were flown and over half a million pounds of relief goods were distributed! 080629-N-0640K-227 PANAY ISLAND, Philippines (June 29, 2008) Commander Carrier Strike Group Seven, Rear Adm. James P. Wisecup and U.S. Ambassador to the Philippines, Kristie A. Kenney, prepare to take a helicopter ride in and HH-60H Seahawk assigned to the "Black Knights" of Helicopter Anti-submarine Squadron (HS) 4 to survey the island and drop off supplies. American and Philippine officials, met at Iloilo Airport to share their goals and show their support for Typhoon Fengshen relief efforts. At the request of the government of the Republic of the Philippines, Reagan is off the coast of Panay Island providing humanitarian assistance and disaster response. Reagan and other U.S. Navy ships are operating in the 7th Fleet area of responsibility to promote peace, cooperation and stability. 080629-N-5961C-002 KALIBO, Philippines (June 29, 2008) Sailors from the Ronald Reagan Carrier Group debark an HH-60H Seahawk assigned to Helicopter Anti-Submarine Squadron (HS) 4 while delivering bottled water to hard hit areas of the region following Typhoon Fengshen. At the request of the government of the Republic of the Philippines, USS Ronald Reagan (CVN 76) and elements of her Carrier Strike Group (CSG) are off the coast of Panay Island providing humanitarian assistance and disaster response in the wake of Typhoon Fengshen. Reagan and other U.S. Navy ships are operating in the 7th Fleet area of responsibility to promote peace, cooperation and stability. 080629-N-5961C-016 PACIFIC (June 29, 2008) A HH-60H Seahawk helicopter from Helicopter Anti-Submarine Squadron (HS) 4 lifts another pallet of bottled water from the deck of Military Sealift Command combat stores ship USNS Niagara Falls (T-AFS 3) for delivery to Kalibo, Republic of the Philippines. Kalibo is on the northern tip of Panay Island and was hit hard by the typhoon. At the request of the government of the Republic of the Philippines, USS Ronald Reagan (CVN 76) and elements of her Carrier Strike Group (CSG) are off the coast of Panay Island providing humanitarian assistance and disaster response in the wake of Typhoon Fengshen. Reagan and other U.S. Navy ships are operating in the 7th Fleet area of responsibility to promote peace, cooperation and stability. 080629-N-5961C-013 PACIFIC (June 29, 2008) A HH-60H Seahawk helicopter from Helicopter Anti-Submarine Squadron (HS) 4 lifts another pallet of bottled water from the deck of Military Sealift Command combat stores ship USNS Niagara Falls (T-AFS 3) for delivery to Kalibo, Republic of the Philippines. 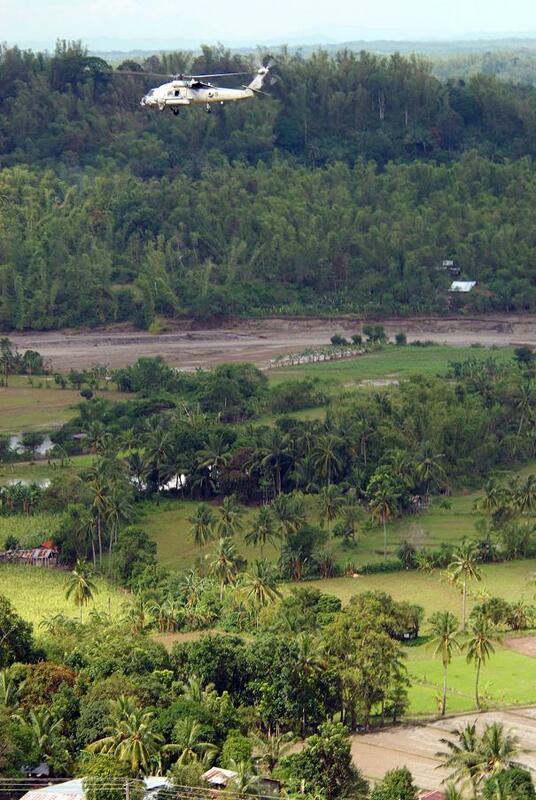 Kalibo is on the northern tip of Panay Island and was hit hard by the typhoon. At the request of the government of the Republic of the Philippines, USS Ronald Reagan (CVN 76) and elements of her Carrier Strike Group (CSG) are off the coast of Panay Island providing humanitarian assistance and disaster response in the wake of Typhoon Fengshen. Reagan and other U.S. Navy ships are operating in the 7th Fleet area of responsibility to promote peace, cooperation and stability. 080629-N-5961C-009 PACIFIC (June 29, 2008) A HH-60H Seahawk helicopter from Helicopter Anti-Submarine Squadron (HS) 4 lifts another pallet of bottled water from the deck of Military Sealift Command combat stores ship USNS Niagara Falls (T-AFS 3) for delivery to Kalibo, Republic of the Philippines. Kalibo is on the northern tip of Panay Island and was hit hard by the typhoon. At the request of the government of the Republic of the Philippines, USS Ronald Reagan (CVN 76) and elements of her Carrier Strike Group (CSG) are off the coast of Panay Island providing humanitarian assistance and disaster response in the wake of Typhoon Fengshen. Reagan and other U.S. Navy ships are operating in the 7th Fleet area of responsibility to promote peace, cooperation and stability. 080629-N-5961C-010 PACIFIC (June 29, 2008) A HH-60H Seahawk helicopter from Helicopter Anti-Submarine Squadron (HS) 4 transports another pallet of bottled water from the deck of Military Sealift Command combat stores ship USNS Niagara Falls (T-AFS 3) for delivery to Kalibo, Republic of the Philippines. Kalibo is on the northern tip of Panay Island and was hit hard by the typhoon. At the request of the government of the Republic of the Philippines, USS Ronald Reagan (CVN 76) and elements of her Carrier Strike Group (CSG) are off the coast of Panay Island providing humanitarian assistance and disaster response in the wake of Typhoon Fengshen. Reagan and other U.S. Navy ships are operating in the 7th Fleet area of responsibility to promote peace, cooperation and stability. 080629-N-5961C-011 KALIBO, Philippines (June 29, 2008) A HH-60H helicopter from Helicopter Anti-Submarine Squadron (HS) 4 delivers another pallet of bottled water from the deck of USNS Niagara Falls (T-AFS 3) for delivery to the northern tip of Panay Island. Sailors from USS Ronald Reagan (CVN 76) were flown out to assist in the vertical replenishment (VERTREP) and are working together with their Philippine counterparts to get water to the people affected by Typhoon Fengshen. At the request of the government of the Republic of the Philippines, USS Ronald Reagan (CVN 76) and elements of her Carrier Strike Group (CSG) are off the coast of Panay Island providing humanitarian assistance and disaster response in the wake of Typhoon Fengshen. Reagan and other U.S. Navy ships are operating in the 7th Fleet area of responsibility to promote peace, cooperation and stability.